Kurban Kawari, salesman at pet store. This video depicts what a life of animal keeper is like. We found Kurban Kawari in Souk Wagif which has the most popular animal stores in Qatar because of the variety of animals they have. But now, the animal stores in Souk Wagif has attracted a lot of attention because of it’s bad treatment of animals. 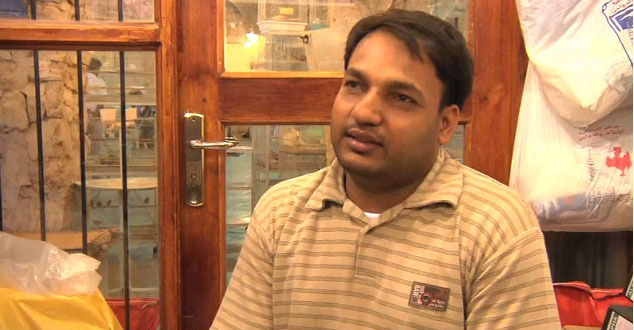 Kurban Kawari is a Nepali expatriate in Qatar who enjoys living in Qatar, although he earns only QR 1500 (app. $410) a month when an average person in Qatar earns QR 9000-10,000 (app. $2500-2800) a month. Moreover, Kawari works 10-14 hours a day. He leaves his wife and children behind in Nepal while trying to make a life in Qatar. Click on the link below to hear his story!